How can anyone resist the charms of this country-crooning cowboy? Wherever Brad Paisley goes, excitement follows. 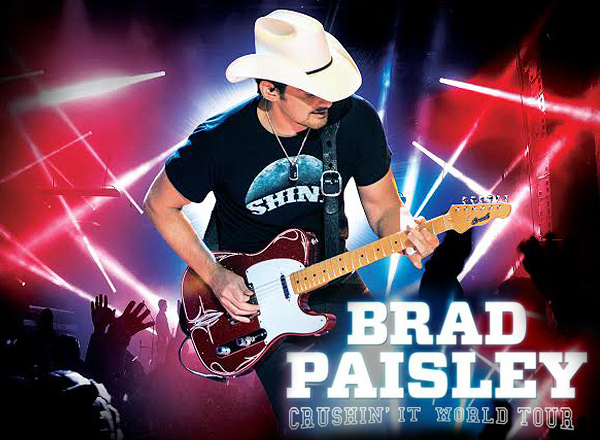 His latest leg of nationwide tour dubbed as ‘Crushin’ It’ promises yet another wild ride of music and revelry for all the Brad Paisley fans out there. Feel the rise in temperature? it’s all from the intense heat of anticipation of fans who are now holding on to their precious concert tickets. Don’t be left out on the cold. Grab those tickets now! A songwriting contract ain’t bad for starters. It became the stepping stone for Brad Paisley. He penned David Kersh's "Top 5" hit, "Another You", as well as sharing song writing credits with David Ball’s single “Watching My Baby Not Come Back. Yet Paisley was destined to have his name on neon lights. His 1999 recording artist debut album ‘Who Needs Pictures’ was certified platinum in 2001. Since then, Paisley was unstoppable. From the 10 studio album he has released, he scored 32 top 10 singles on the U.S. BillboardCountry Airplay chart, and 19 of which are #1s. In 2009, he set a record of having the most most consecutive singles (ten) reaching the top spot on that chart. The commercial success of his albums reached a whopping 12 million unit sold (and still counting). Brad Paisley also collected citations from the prestigious Grammys (three), Academy of Country Music Awards (fourteen), Country Music Association Awards, (fourteen), and American Music Awards (two). Yet, he considers his membership to the Grand Ole Opry as his crowning achievement. Saying that a Brad Paisley concert is wildly fun and exciting, could still sound like an understatement to his adoring and loyal fans. Thus, a concert like this from an undeniably talented country superstar is best seen, heard, and experienced.